About a month ago I finally placed all the Giller Prize shortlisted books on hold at my library, and hoped to read as many as possible before the prize was announced. Well, tonight is the big night! Unfortunately, I did the bandwagon jump too late to receive and read most of the books in anything like enough time to accomplish that goal. 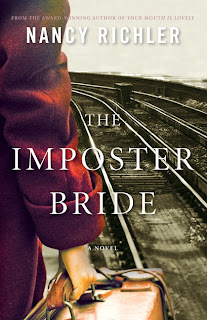 I still plan to read Inside by Alix Ohlin, Will Ferguson's 419, Kim Thúy's Ru, and Russell Wangersky's short story collection Whirl Away as soon as I possibly can, but I did manage to read Nancy Richler's The Imposter Bride just under the wire, and am I ever glad I did! I am hoping that I can make it home from running Erin to dance class in time to watch the televised event on CBC. From the first scene, I was drawn into the post-war world of Jewish Montréal. 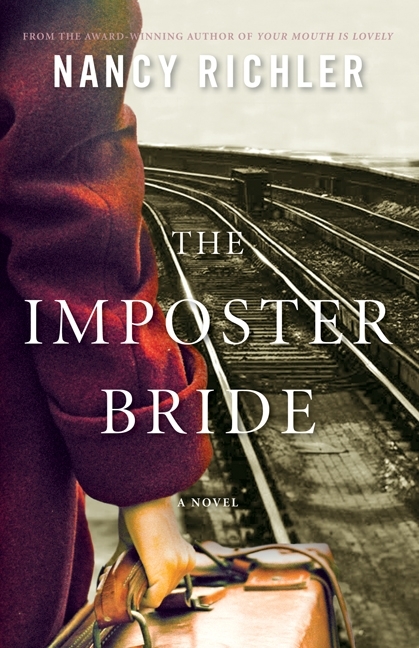 Lily Azerov, a Polish Jew arrives in Montréal and waits on the train platform for the man she has arranged to marry. Sol Kramer, her fiance, sees her there, but intuitively turns away and without a word, rejects her as his wife. His brother, Nathan steps in and Lily and Nathan are married. A sense of mystery surrounds Lily and we find that she is not who she claims to be. She had stolen the identity of Lily Azerov, along with a journal and a rough diamond, from a dead girl in Europe and her true identity remains submerged. At the wedding of Nathan and Lily, Sol begins talking to two strangers, the only two uninvited guests - a woman, Ida Pearl, and her daughter, Elka - who came to see if the newly arrived bride was a member of her missing family. Ida confirms that Lily is not her cousin of the same name, but clearly she knows more than she is letting on. There is something sinister about Ida. Will she tell what she knows? A year later, Lily leaves their home, and three-month-old daughter under the pretext of running out for some milk. She disappears. The family pulls together with love and support to help Nathan raise baby Ruth. Sol marries Elka who becomes a type of surrogate mother to Ruth, along with her paternal grandmother Bella, and Elka's mother Ida Pearl. Ruth knows little about her mother, and until her sixth birthday when Lily sends Ruth a gift she has not missed her. 'We can't escape it. None of us,' Nina said. 'I thought it was opposing thumbs,' I said. All of the characters are grieving a part of their lost story, and many have lost either parents or children through war, death or abandonment. 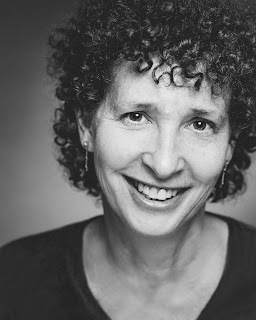 Nancy Richler tells a poignant and powerful tale of loss, separation, grief and isolation. The legacy of war ripples through each character and their children. Lily is so adrift without her own identity, without the memories of her family (her dead do not even visit her in dreams) that she isolates herself in her bedroom, unable to function fully in her new life. Nancy Richler inserts gentle reminders throughout the novel of the pain and grief that surrounds Ruth as a result of the war, and reveals the characters through their reactions, most poignantly of her elementary school teacher, Mr. C. who would stand, silently sobbing in front of the class. Until each character is able to reconnect with that lost sense of origin they remain searching and incomplete. When they are ready to face their whole life and their whole past, they become fully realized characters. The story is part mystery, part family history, part fairy tale. Ida Pearl is a sort of fairy godmother to Ruth. She came uninvited to the wedding (I was waiting for her offer up a curse involving a spinning wheel), was blessed with an intuitive nature (she saw Ruth's worst fear without being told), and is the keeper of the secrets. As Ruth grows up, her curiosity about who her mother was and is continues. It is, of course, Ida who tells Ruth the first truth about her mother, and gives her the key that unlocks the rest of the story. This is a sad, but not a depressing story because in combination with the theme of exile, of separation and loneliness are the essentially redeeming characters of Ruth and young Elka who bring energy and continuity. They carry forward with the best of the preceeding generation. The elements of mystery and suspicion that prevade the beginning of the book fall away and are replaced with acceptance and compassion. Ultimately, the sadness in the story is not what remains. What resonates is the hope and optimism of moving forward, of moving on, of honouring and remembering with love and respect.